A grotto is a natural or artificial cave used by humans in modern times and antiquity. Today, they are often used as shrines in which to place statues of saints, particularly the Virgin Mary. The Grotto of Our Lady of Lourdes stood in the southwest corner of the grounds of St Patrick’s Church. 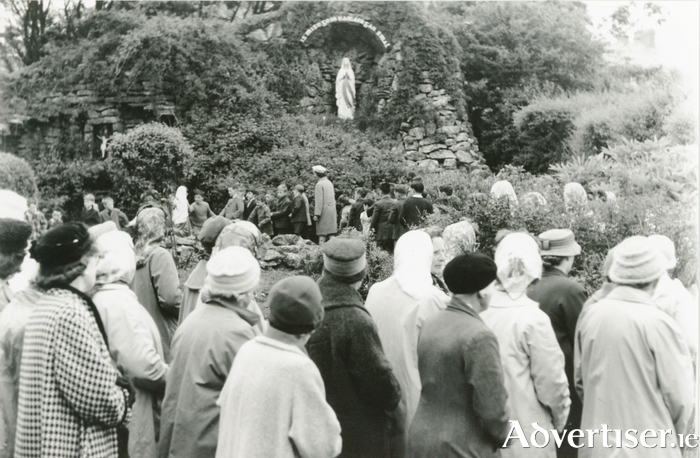 “High in the rockery, standing in the nook, stood the statue of Our Lady, her eyes raised heavenwards. In every season, the rockery was a cornucopia of colour; purple pansies, pink ground roses, evergreen of every hue. Hyacinth, snowdrops in spring, viola and gold marigolds in autumn. Surrounding the grotto was a white-painted stone altar rail, broken at the corner by a locked wooden gate which was painted blue. To linger in the grotto was to be in silence. The passing traffic, the noise of the altar boys playing ‘tag’ around the church never seemed to disturb the tranquillity of the sacred space. Some memories there from Mary Gilroy Johnson originally of the parish, who now lives in Tralee. It was in the month of May, 1836, that the foundation stone of St Patrick’s Church was laid. A Father Bartholomew Roche was appointed administrator of the parish of St Nicholas East (Bohermore ) and as the parish did not have a church, he decided to build one. He set off on several journeys to England to collect sufficient funds for its construction. Unfortunately, the roof of the church was blown off on the ‘Night of the Big Wind’, January 6, 1839. Fr Roche persisted however and on January 11, 1842, his church, though not yet complete, was opened. The sermon at the Mass was preached by the temperance reformer, Fr Matthew. In the 1860s, legal difficulties made it impracticable to maintain the church as a place of worship. The grounds of the church consisted of various plots on short leases from different parties; when the leases fell in, the owner of the plot in front of the church refused a renewal and erected a wall cutting off regular access to the entrance. It took 35 years to resolve the impasse. The church was rededicated on March 13, 1898. In 1936, the top storey of the tower was taken down because of structural faults which could not be rectified without considerable difficulty. The old church was replaced by a new one in 1972.